We travelled to Dublin on December 8th to do some Christmas shopping and enjoy a few days in Wynns Hotel. We braved the snow and ice and were very careful to look out for one another. I am glad to report that the two day trip was most enjoyable and accident free. On our first night, after an early dinner at our hotel, we went to a play in the Gate Theatre. The play was an adaptation by Alan Stanford of “Jane Eyre” written by Charlotte Brontë over a hundred and sixty years ago. Jane Eyre( played by Andrea Corr of music group The Corrs) is a woman, who despite a troubled past, struggles as best she can with life’s challenges. She falls in love with Mr. Rochester, played by Stephen Brennan, which indeed presents its own difficulties. But things work out in the end and it’s a wonderful story, beautifully acted and I would really recommend it to all. 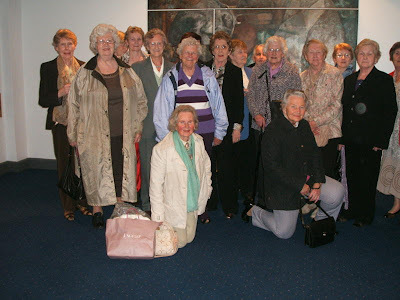 On our second night we went to the new theatre, the Grand Canal Theatre. It’s a magnificent theatre with wonderful facilities and stage management. Here we saw the musical “Scrooge”, the title role being played by the legendary Tommy Steele. The whole production had come over from the London Palladium. It’s a wonderfully warm family story, with great sets and costumes and fantastic musical airs and spectacular dance throughout the show. It was thoroughly enjoyed by all of us and was the highlight of our trip. We returned home the following day to resume our normal lives! The Alps from a bus window.---- Doug. 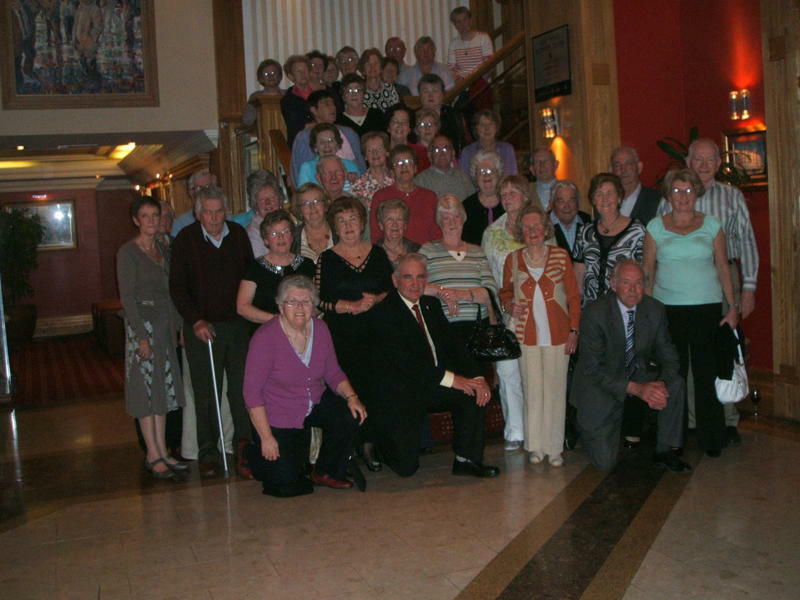 On Saturday September 11th a group of 47 departed Ballinasloe at 3.00 a.m. to catch our Aer Lingus flight to Venice at 8.30 a.m. When we arrived in Venice at 11.05 a.m. local time we were excited to see a cloudless blue sky and feel the warmth of the air. Our holiday began on reaching our 4 star Cambridge Hotel. We rested for a couple of hours as we had such an early start to the day. Dinner was at 7.00 p.m. so we dressed up in our finery, came down in the lift and waited eagerly outside the restaurant door. The beautiful stained glass door was opened, a musician played a rousing tune as we marched in and were presented with a red rose and sat down to an 8 course candlelit gala dinner. What a great start to our holiday! The hotel is situated by a lovely beach with recliners and parasols to accommodate the guests. A lovely pool just outside the hotel is a relaxing place to sit or sun oneself furnished with recliners and parasols too. On Tuesday a group went to Venice and visited St. Mark’s Square and many other interesting places. 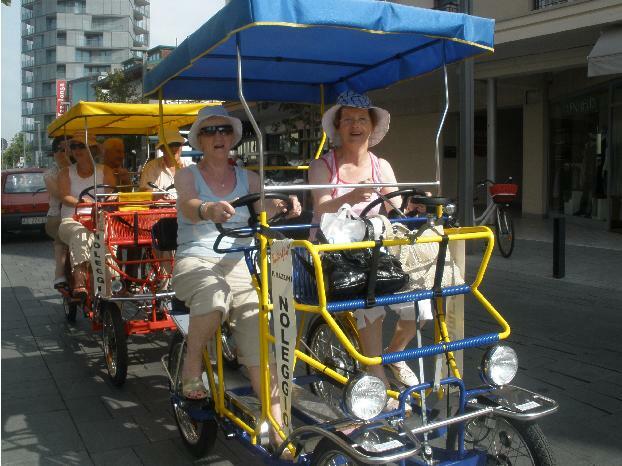 We, who remained in Jesolo, cycled on 4 wheeled bicycles steered by some of the men and pedalled around the town on cycle lanes. It was great fun and a lovely leisurely way to explore the town. On Thursday a group went to Verona and Lake Garda and a small group of 7 or 8 went to the Dolomites and Cortina. The weather remained glorious and sunny until Friday which was cloudy and rainy and there was a downpour on Friday night. Some of us went to Padua on Saturday to visit St. Anthony’s tomb. We touched the black stone at the back of it and petitioned him for our personal intentions. At night time after dinner we walked off our calories either on the beach walkway or down town. Games of bridge and 25 were played some nights. The weather was good again on Sunday and Monday and people sunned themselves on the beach. 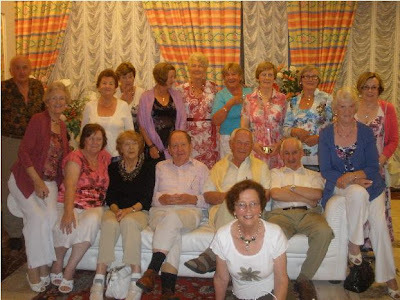 Most of the group had massages during the week so we arrived back in Dublin on Tuesday afternoon really relaxed after a fabulous holiday in Lido Di Jesolo. 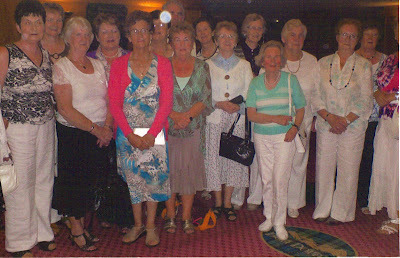 Ballinasloe Active Retirement travelled to the Galway Bay Hotel for a short stay in Galway City. 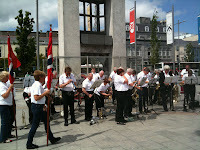 As happens on occasions, the weather was very kind to us despite a bad weather forecast. Salthill was a busy place, full of visitors. We had a great time and enjoyed lovely walks on the prom. Then on our last night we attended a concert called Trad on the Prom at the neighbouring Salthill Hotel. It was a wonderful production by the Fahy family and Chris Kelly. Anyone who enjoys traditional music would appreciate the talents of this very musical family. It was the perfect finish to our short holiday. 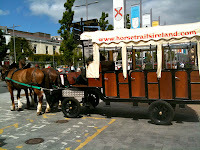 · Horse racing, corporate style, will be held in Galway this year on Bank holiday Mon.25th October. Cost for a four course meal without wine, on third floor with a view of track will be €55 + cost of bus. If interested, please give your name to-day. · Watch out for Cruise news in Spring 2012 !!! Ø Make full use of your diary to help you to remember which trip you have signed on for--- date, cost, deposit paid, balance due, etc. 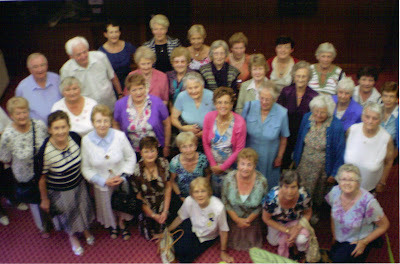 On Wed. 14th July’10, 47 members of the Ballinasloe Active Retirement Association had a very pleasant trip to Cong. 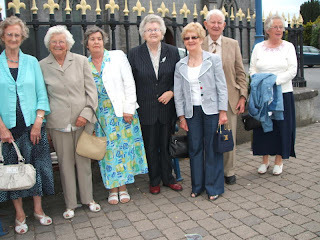 We started off by bus from St.Michael’s square at 8.30 a.m.. The weather forecast was bad, but we needn’t have worried as we managed during the day to escape most of the showers. 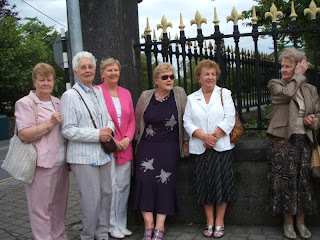 We drove to the pretty village of Cong and from there we took a boat up the Corrib. Our Captain gave us an entertaining talk as we passed various islands. He told us that many years ago the Corrib was a busy trading area, boats plying up the full length to the City of Galway. He also told us about the Canal that never was! 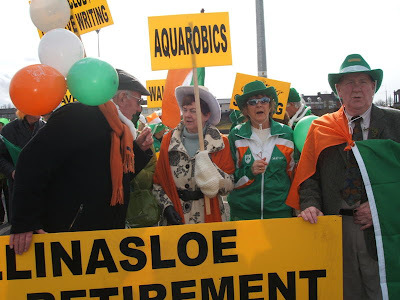 A lot of time and money and manpower was spent in digging this canal between the Corrib and Lough Mask. When it was eventually finished, the porous limestone could not hold the water, so the canal had to be abandoned. 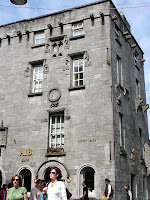 After the boat trip, we went to see Ashford Castle and were impressed by it’s size and the beautiful grounds. . Unfortunately we were not residents and were not allowed inside. A few intrepid members of our group peeped in the door, and some more courageous went into the diningroom. Then we went to Ryan’s Hotel for our lunch. And a very good lunch it was too! After lunch we were taken on a tour of the sites of the film “The Quiet Man” We had a very witty and entertaining guide who encouraged us to act out parts from the film. This started off with Jimmy Lyons being allocated the part of “the dying man” This character in the film, hearing that a fight had started in the street outside his house forgot about dying, jumped our of bed and ran the length of the street while holding up his trousers! We got back to Ballinasloe at 6.15, tired but happy with our day and thankful to Bridie Whelan and Chris O’Flynn for all the hard work of organising the outing. 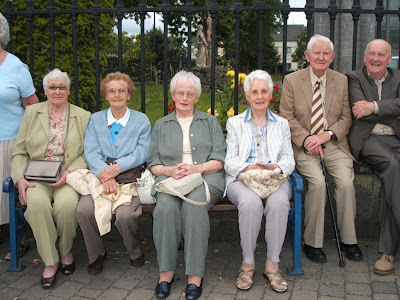 Members try out as extras on the set of "The Quiet Man"
Ballinasloe 3.30 am, fifty-nine of us gathered in the gloom and left by coach for Dublin Airport, arriving at approximately 5 am. 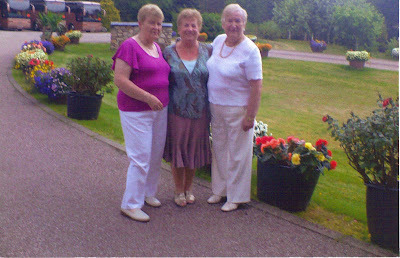 From there we travelled to Prestwick where our “Highland Heritage” coach and driver awaited us. On our way north we had some time in the city of Stirling. Some of the party took the opportunity to do shopping and sightseeing; others, suffering from the after-effects of lack of sleep, found quiet corners in which to relax. On then to our hotel in Tyndrum, having viewed “Hamish” on the way. What can we say about our hotel? Situated in a beautiful spot, surrounded by mountains, it was like an oasis after our long journey. We were warmly welcomed by the manager, resplendent in his kilt. He took the opportunity to lay down some simple ground rules - times of meals, nightly entertainment, etc. The hotel was everything we could have wished for with comfortable bedrooms, very good food and nightly entertainment after dinner. Started wet but by the time we reached Loch Lomand for our cruise the rain had almost ceased. We enjoyed the cruise and after proceeded to Helensburg, a lovely little town on the estuary of the River Clyde. By now the sun had appeared and we had a grand afternoon. Today saw us head northwest, passing through Rannoch Moor and Glencoe, the latter the sight of the massacre of the McDonalds by the Campbells. Our driver told us that a local hostelry boasts a sign to the effect that no Campbells would be served there! On through Fort William where we stopped briefly, for refreshments and a bit of shopping, before proceeding over the Caledonian Canal, where we saw “Neptune’s Staircase”- a man-made structure, beautiful in its own way. On to the fishing village of Mallaig for lunch and a stroll around this seaside place with a view of nearby islands. Back then, to our hotel, through spectacular scenery. We travelled southwest to the Isle of Bute, reached from the mainland by a four minute ferry ride. Our bus then took us to Rothesay, the island’s principal town where, after lunch, we had a few hours for sightseeing, in glorious sunshine. We noticed, among other things, a small commemorative plaque to the men of Bute, who, in 1298 left the island to join William Wallace in his fight against the English. None of them survived. Our last full day took us west on a short journey to Oban, a very busy port. There was no shortage of restaurants or shops and we had an enjoyable few hours before going south to the Isle of Seil. Here our driver drew our attention to the humpbacked bridge which brought us on to the island. She promised to let us leave the bus on the way back to, as she put it, “walk across the Atlantic”, which we duly did but not before spending some time on the quaint little island. 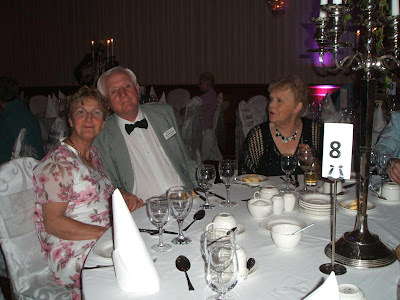 Wednesday night, being our last night, we had a gala dinner at the hotel. Some of us even managed to eat the haggis, a Scottish delicacy, which is much like our own white pudding. This was piped into the dining room with due ceremonial. Early start this morning, in the rain, which persisted for some time as we went south but, thankfully, had cleared by the time we reached Prestwick. Our flight to Dublin was pleasant. Our coaches met us at the airport and we carried on to the Spa Hotel in Lucan for a very welcome and substantial meal. This had been arranged by our hard working committee. An hour and a half on the coach found us in Ballinasloe at 6 pm, tired, but well content after a great holiday. It is only fitting before we finish that we should give full credit to the committee who arranged everything so efficiently - they even had enough money left to pay for our meal in Lucan. Well done! Congratulations to our own Chris O’Flynn who received a nomination to the Ballinasloe Mayor’s Awards held last week in the Shearwater Hotel. Her nomination was in the Social and Community Support category. 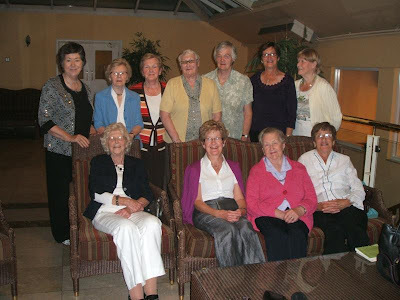 Chris, one of the founder members of the Ballinasloe Active Retirement Association, has worked tirelessly over the years for the members of the association. 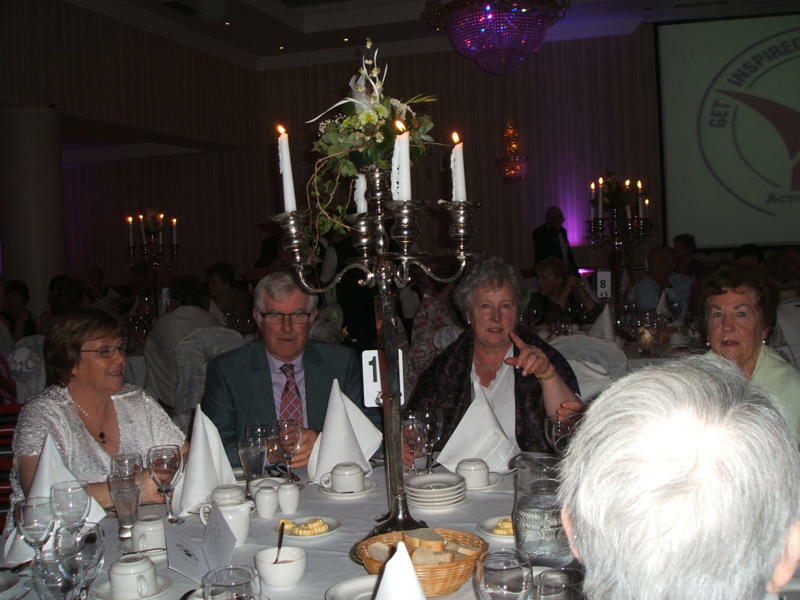 At the award ceremony our Mayor, Johnny Walsh, acknowledged people who have made a positive contribution to the quality of life in Ballinasloe. The Mayor said that there was no greater accolade than being recognised by your own community. Let's say it's 6.15pm and you're driving home (alone of course) after an unusually hard day on the job. YOU ARE REALLY STRESSED AND UPSET …. You are only five miles from the hospital nearest your home. YOU HAVE BEEN TRAINED IN CPR, BUT THE GUY THAT CONDUCTED THE COURSE DID NOT TELL YOU HOW TO PERFORM IT ON YOURSELF !!! DO NOT PANIC, BUT START COUGHING REPEATEDLY AND VERY VIGOROUSLY. LIFE STYLE, HEARTATTACK IS FOUND AMONG PEOPLE OF ALL AGE GROUPS. Participants of the first course in the use of our new defibulator. 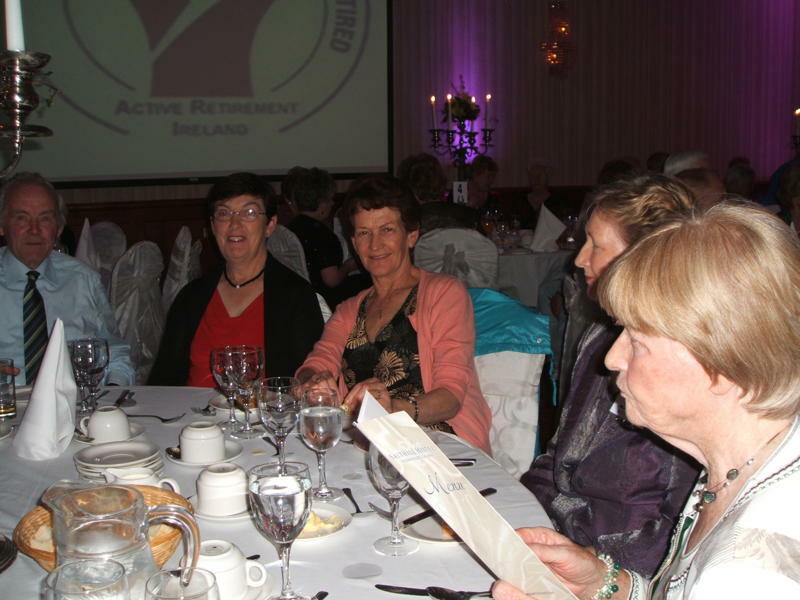 The Ballinasloe Active Retirement Association held its Bealtaine Festival in Gullane's Hotel on Friday, May 14th. Bealtaine is the national arts festival celebrating creativity in older age. The overall theme of the festival for 2010 is 'Have dreams and speak them without fear'. 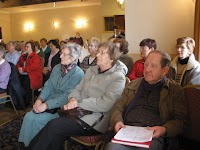 A large number of members were in attendance. 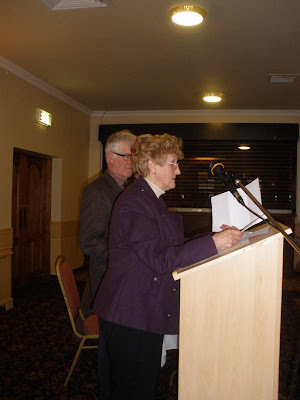 Master of Ceremonies was well-know local actor John Boland, who treated the audience to a delightful recitation of “The Village Schoolmaster” by Oliver Goldsmith. A wonderful night of music and song was provided by the Active Retirement’s own BARA Singers, ably assisted by visiting choirs from Athlone and Portumna. Musical director for the night was Marie Power. 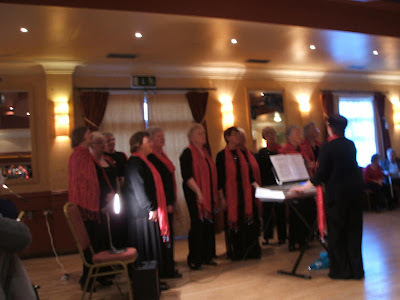 The audience sang along to some of the beautiful airs, with a few even performing solo as well. The winners of the Bealtaine photo competition were Daphne Kenny and Eileen Kelly. A lovely exhibition of art by members of the art group was on display, as well as an exhibition of knitting by the knitting group who donate their work to an orphanage in Belarus. 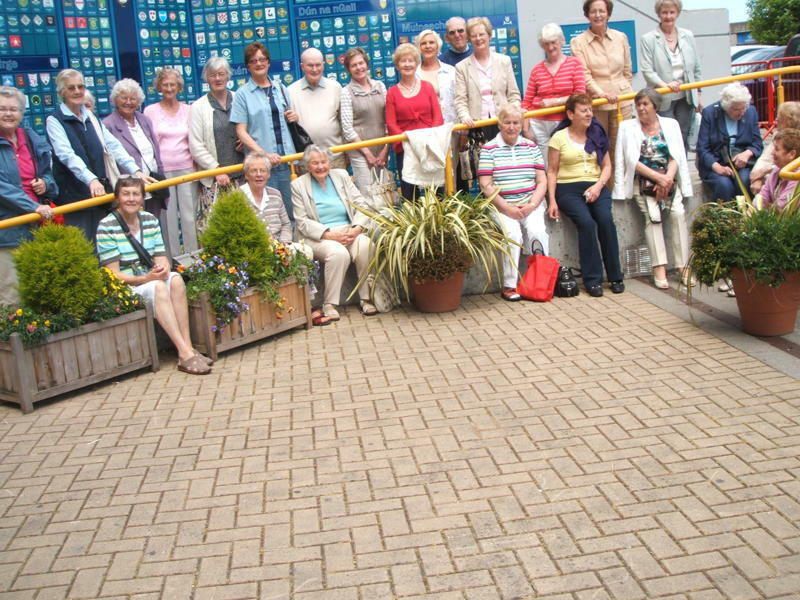 There was also a large display of photos of past events and places visited by the Active Retirement Association. The Chairperson, Gabriel Rohan, worked tirelessly to make this festival a huge success. On May 1st a group of the Ballinasloe Active Retirement Association attended a Finbar Wright concert in the Town Hall Theatre in Galway. We enjoyed a wonderful evening of entertainment listening to Finbar’s beautiful singing and his talented group of backing musicians. Finbar Wright is one of Ireland’s most accomplished singers and is also a very engaging and entertaining performer. He has won many accolades over the last twenty years at home and abroad. 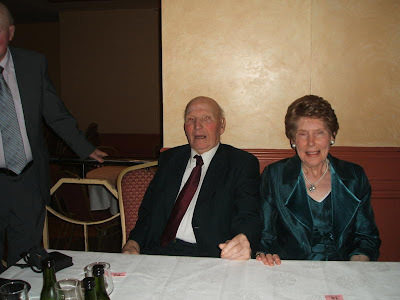 He is one of Ireland’s great singers of romantic songs and ballads. During the two hour concert he sang such favourites as “Whatever You Believe”, “How Great thou Art”, “Bright Blue Rose”, “La Bamba” and many more. Finbar is a classically trained tenor and is also fluent in Spanish, Italian and French. He is very spiritual and always includes one piece, at least, of sacred music in every concert. Last night’s concert was no exception. Our members were very appreciative of his wonderful performance. 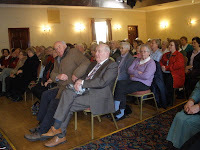 His easy style, vocal range and pleasant personality ensured a wonderful evening of song, memories of which will linger for some time to come. 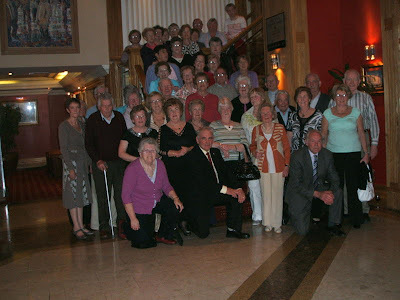 On Sunday 11th April a group of Ballinasloe Active Retirement members set off to Wexford on our spring holiday. 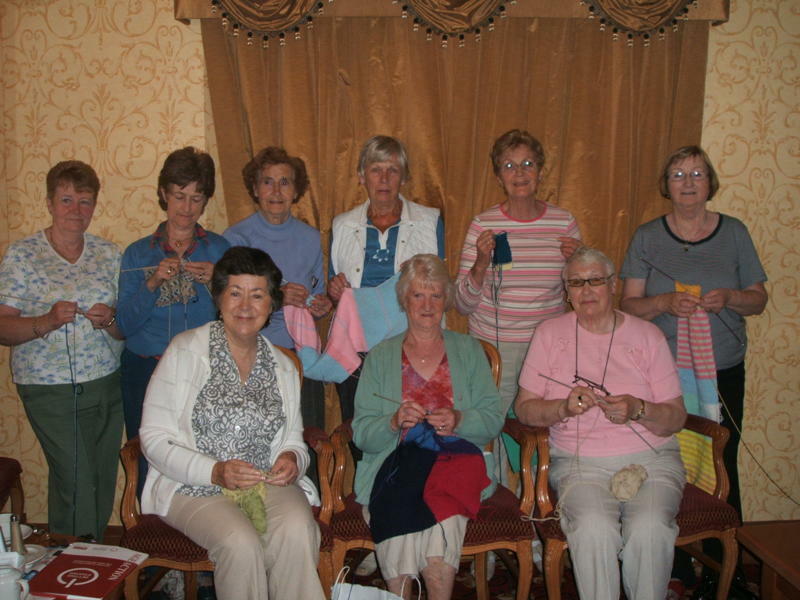 We had three wonderful days full of activities and excursions, with nightly sing-songs and a few games of Bridge. The journey there and back was a little tiring but we stopped on the way for coffee and lunch. Of course the good weather added greatly to our trip and the whole countryside was a mass of colour in the sunny south-east. We visited the John Fitzgerald Kennedy Arboretum and marvelled at the variety of shrubs and trees. The visit to the Dunbrody famine ship was a sobering experience as we encountered the harrowing experiences of our forefathers. We visited Our Lady’s Island. We were impressed by the stories of the many pilgrims that go there and of the many cures attributed through the intercession of Our Lady. So we lit some candles in the church and got holy water from the holy well there and prayed for the intentions of all our families and our sick members who were unable to be with us. Hook Head Lighthouse, which is the oldest lighthouse in Europe, was very interesting and we enjoyed the guided tour. Afterwards we visited the cafe and browsed in the craft shop. The Irish National Heritage Park is where we learned about the history of Ireland and is located 3 miles from Wexford town. 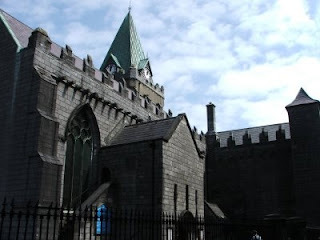 The centre recreates the history and heritage of Ireland from the Stone Age to the arrival of the Vikings and Early Normans. The Vikings came to Ireland at the end of the 8th century, first plundering the natives but later coming here to trade and settle. 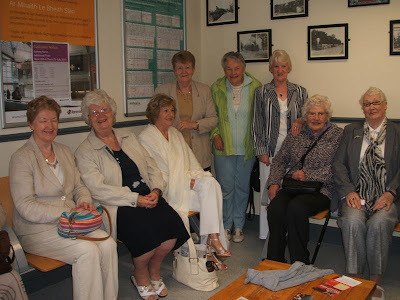 Our trip would not be complete without visiting the National 1798 Centre in Enniscorthy. 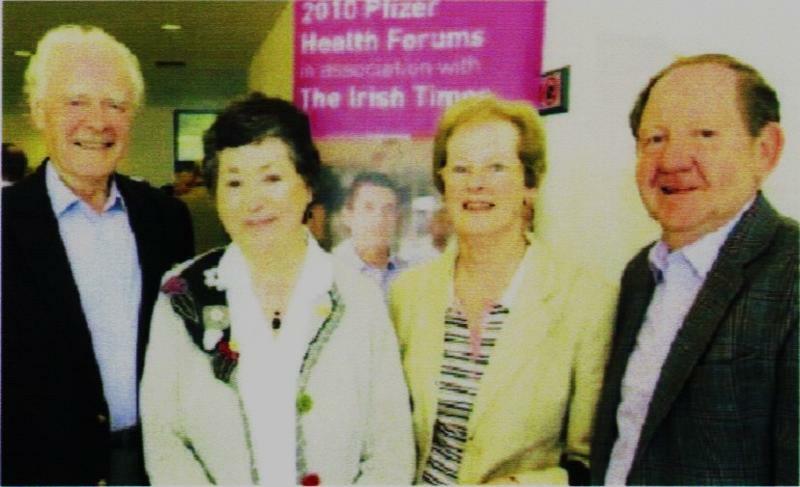 This is an award-winning centre, located in the shadow of Vinegar Hill, beside the picturesque River Slaney. Ghost-like life-size plaster figures represent the people of 18th century Ireland. 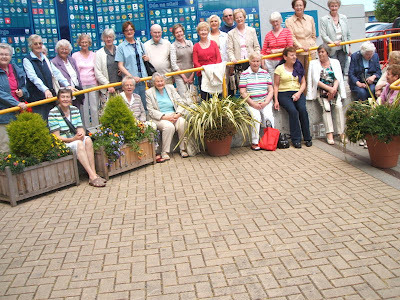 A visit to this centre is a must for all visitors. 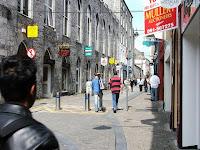 Our hotel, the Talbot, was situated in the middle of the town of Wexford. Many of the rooms had a view of the sea. The staff were friendly and professional and the food was well-presented and delicious. To date this was one of our most enjoyable spring holidays. 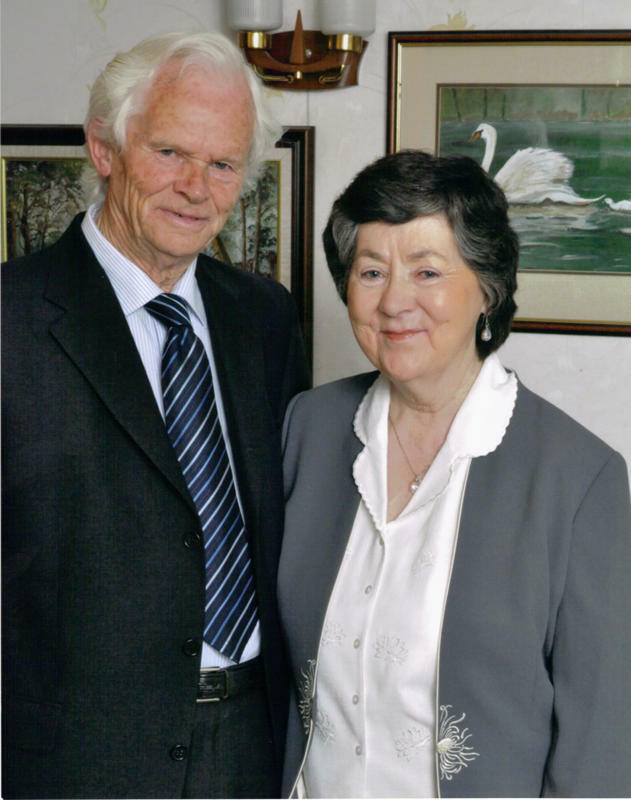 It was with much regret that we learned of the death of Rose Moore at the weekend. Rose was a much cherished member of the Ballinasloe Active Retirement Association and had been for many years. 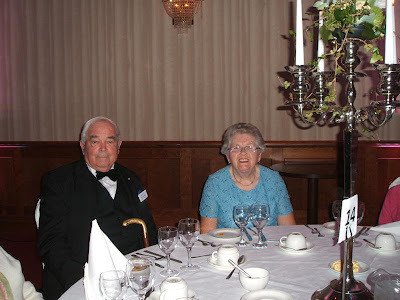 She was a very pleasant lady who enjoyed the company of other members and had a smile for all. 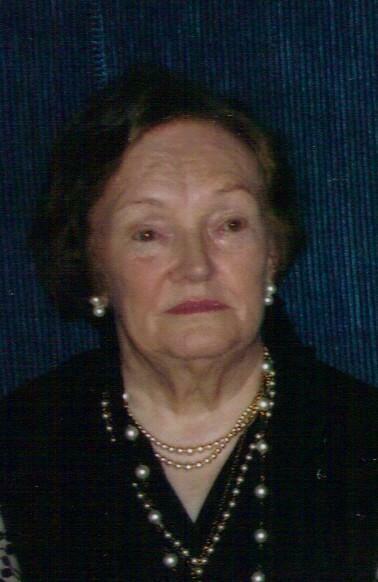 A native of Ahascragh, her husband Paddy predeceased her many years ago. She raised her beloved family of two sons, Philip and Niall, and one daughter, Rosemary, single-handedly. She was a wonderful mother who was always there for her children. As she herself would say “I was there when they needed me”. 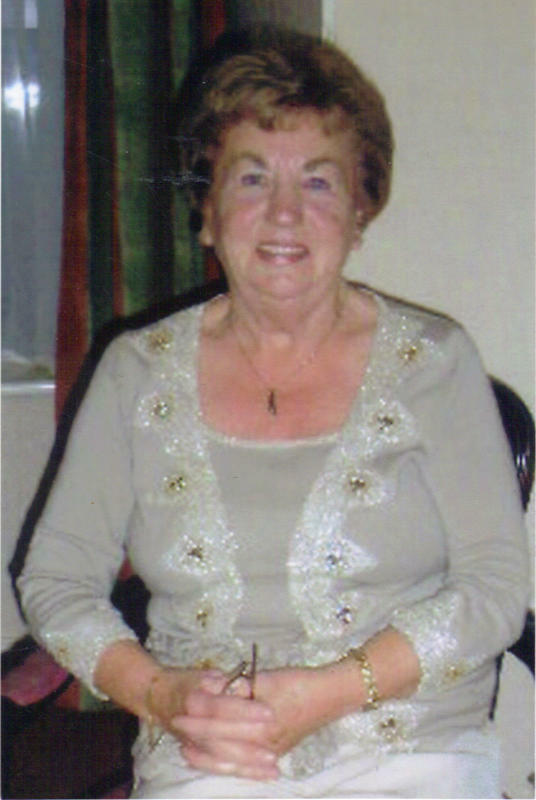 She was gentle, kind and loving to her family and to her many friends. She loved a game of Bridge. Her bidding was always very exact as she played by the rules and never made another player feel inadequate. She smiled whenever she lost and was quick to congratulate her opponents. She very much appreciated all the help given to her by her good friend Angela Courcey. Rose could always rely on her friend in good and bad times. We shared many lovely trips at home and abroad. 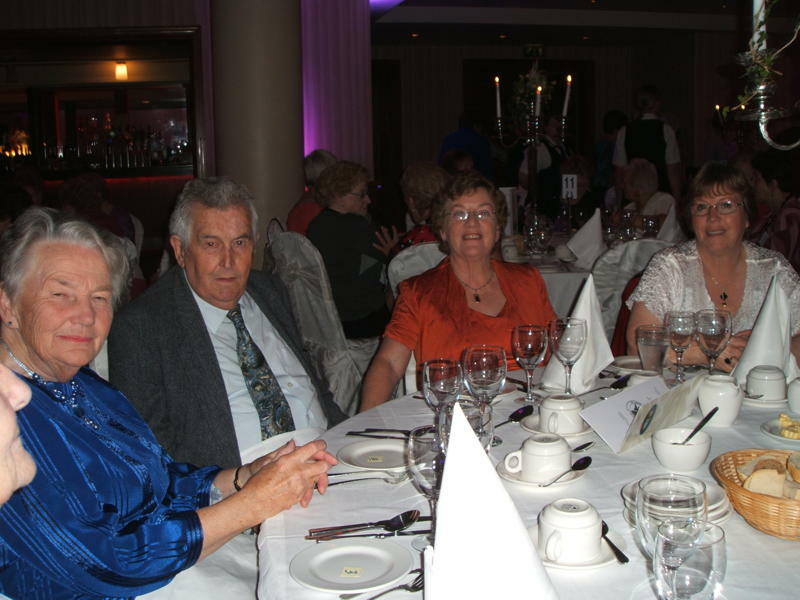 Especially memorable was our first cruise with Rose and we have many other happy memories of her, a kind and gentle lady.